But what about gentle foaming cleansers, I wondered. Well, it seems even those are capable of removing healthy oils from the skin. According to a study published in the Journal of Cosmetic Dermatology in 2017 on cleansing, many surfactants used in foaming cleansers cannot distinguish between oily skin soils and intercellular lipids required for healthy barrier function. Meaning they often times remove both causing barrier damage and subsequently rough, scaly skin texture. This isn’t to say that foaming cleanser should never be used. 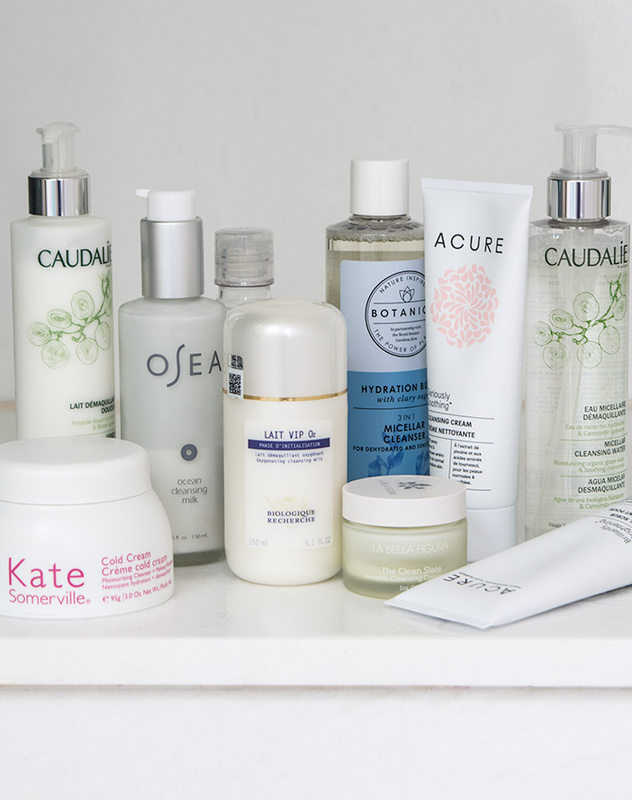 The study highlights them as best for oily skin types. While cleansing milk, yup, you guessed it, is best for dry skin and excellent, the study reports, if you have sensitive “diseased skin” aka rosacea, dermatitis, eczema. 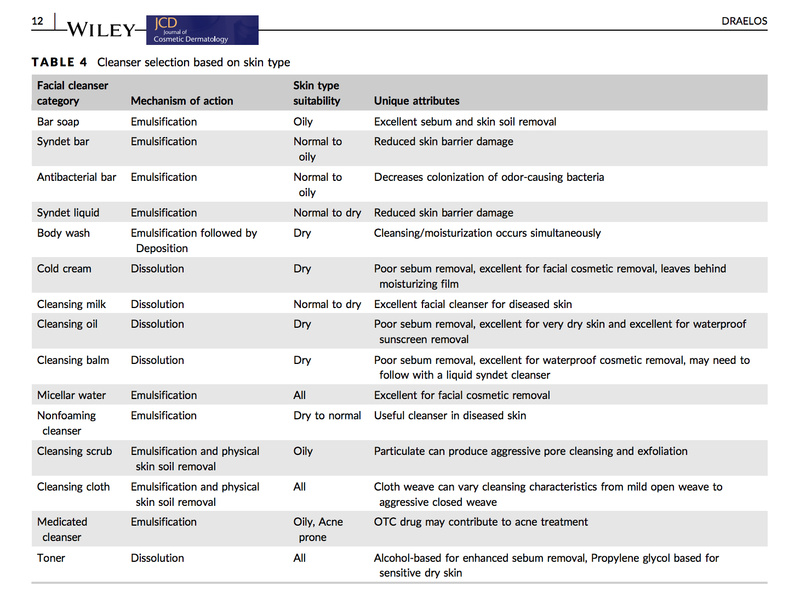 Here’s the full table breaking down their cleanser recommendations. Since making the switch to cleansing milks, I’ve noticed a dramatic improvement in my overall skin texture. And my skin feels more balanced, hydrated and resilient. Case and point: After giving birth to Chloe, my mother’s first comment was,”OMG, the baby is beautiful!” Her second was, “Wow, your skin is so soft and smooth!” And I probably shouldn’t even mention that her third was, “So, what’s your plan for getting your body back in shape?” *Insert eye roll here. If you are looking to incorporate a cleansing milk into your routine, here are a few I’ve been testing and recommend! 1. Osea Malibu Ocean Milk Cleanser is my favorite of all the cleansing milk products I tried for its ability to soothe redness associated with rosacea and dermatitis; one of my biggest issues. The main ingredient – algae extract – is loaded with anti-inflammatory amino acids and healing vitamins (A, B,C and E). 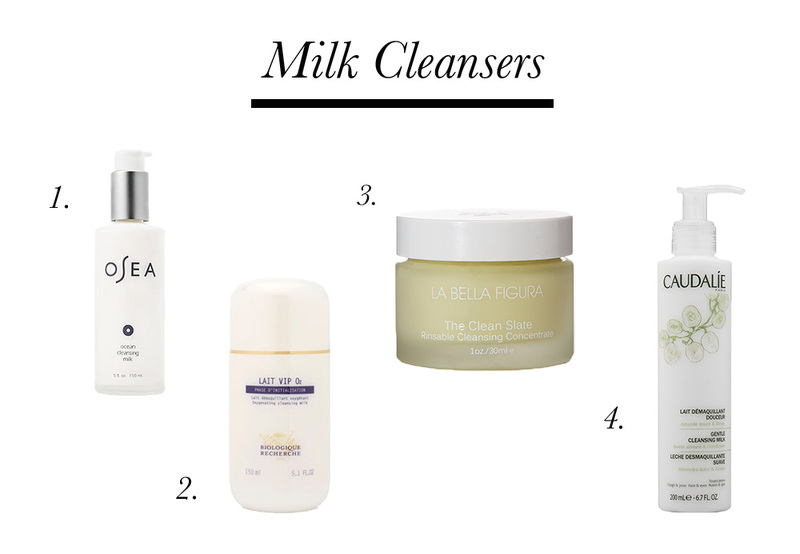 Unlike other milk cleansers which contain animal derived milk/lactic, the Osea milk cleanser is vegan. It utilizes witch hazel and white water lily (a natural source of citric acid, similar to hibiscus extract), to promote very gentle cell turnover. And there’s very little fragrance in this product – great if you’re sensitive to scents. 2. Biologique Recherche Lait VIP 02 contains lactic and salicylic acid in amounts my sensitive skin could tolerate! And was very impressed with its ability to brighten pigment within the first week. Because of the acids, it’s best to avoid the eye area when using. And use a cleanser to remove makeup before applying this cleanser. 3. La Bella Figura’s cream cleanser The Clean Slate utilizes cupucau butter which is rich in plant phytosterols, found in studies to be capable of slowing down UV-induced collagen breakdown and stimulating the production of new collagen. This is a great option for anyone with thin, crepey, aging skin. 4. Caudalie Gentle Cleansing Milk is a good basic cleanser to have on hand. The price point is more reasonable than the previous cleansers, but it doesn’t have any standout ingredients like they do. This cleanser is great to have on hand as a gentle makeup remover so you can save your more active cleanser to do the second cleanse. 5. Kate Somerville Cold Cream ended up in my Sephora basket a few weeks ago on a whim. While I love the cooling, soothing feel of this product, I don’t love the ingredients. This cleansing cream unfortunately contains endocrine disrupting preservatives, like benzyl benzoate and benzyl salicylate, and synthetic fragrances.